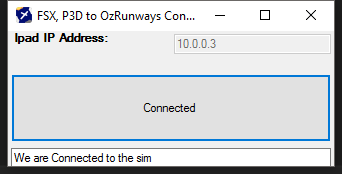 While you can use FSUIPC to communicate with OzRunways something that always bothered me is that it’s using FSUIPC! 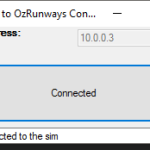 These apps use the native Simconnect option to allow you to connect to the sim. Simply download, extract, run put your Ipad ip in, start the sim and hit connect! Oh like normal.. these are supplied as is.. use at own risk etc. If you do run into any major issues Email me and I’ll do my best to help you out.. but it really should be as simple as IP, Connect. thats it. The P3D Version is built against the 3.X sdk. So I’m doing this post and update to try and answer that (And it will be going into the FAQ!). The PC-9 version that you see in my videos is what I call the ‘Advanced’ update, it was like most things I code done between bouts of pain and nights where I could not sleep because of it and I needed a way to take my mind off things. The Goal of the Advanced was exactly what the name suggests to make an ‘Advanced’ version of the PC-9 that was accurate as hell far more than the fellow dev’s at the time of the original release felt was warranted for that product. That update was completed in Dec/Jan/Feb of 2015! ie over a year ago, the installers where given to IRIS so they could update the existing product back then however it hasn’t been as many of you know. The guys who have the Advanced version found some bugs over the past year and I updated those and made another installer, again IRIS has that installer. As I can NOT check who has brought a product and who has not I can not release the update with out majorly stripping out a lot of the installer base so that you only got updated panel sets etc, etc, etc. I can’t do this and no I can’t ’email you’ a link to get it either. If you want the Advanced let IRIS know you do and get them to release it! On the Battlefield Air-Lifter, at the current time I have stopped all work ont he BFA I haven’t touched the code in close to 4 months or so. The update was aimed to add tacpack into the aircraft, upgrade the FDE to something more realistic and bring the avonics over to something that actually matched the real aircraft, during the course of doing that it became clear that some 3D model changes needed to take place to fix some issues that had arose. I do not have the ability to do that (Oh I can do the 3D modelling but I don’t know how to do the other parts the 3D max – FSX part). Due to this the update is kinda in a semi-finished state and one I’m not ‘fully’ happy with, I understand that alot of you want the FDE that is seen in those videos! Where the aircraft handles like a real aircraft and not a fast jet gone wrong and the avonics look like they do in the real aircraft, in the future I might see if I can’t release the FDE for you but I can’t make any promises on that either. The Long and short of it is though people that I’m not well, I do this when I’m able to try and take my mind off the pain that I am in and I don’t control what gets released and what doesn’t for those whom I do work for, nor do I have the ability to just give away that product when it contains work other than my own like the PC-9 installers do, you will need to ask IRIS about it.. not me.